of lavender, rose, maroon, red, or white. cool temperatures, fresh air, and ample moisture. 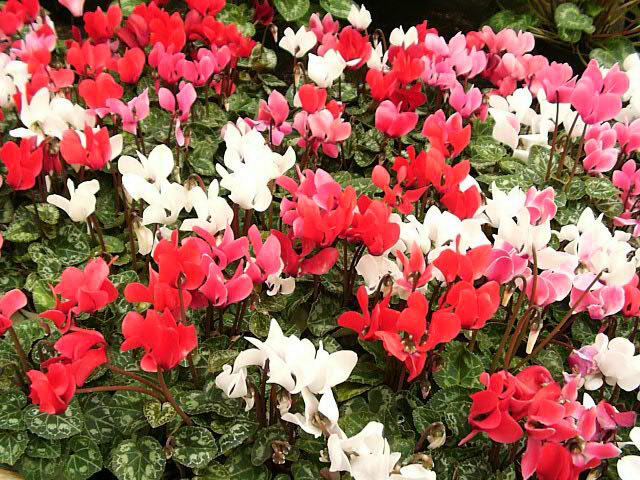 Cyclamen will rarely succeed if the temperature goes above sixty-five degrees during the day and fifty degrees at night. Cyclamen said should be watered daily to keep the soil moist. Because they prefer a humid atmosphere, misting is beneficial. Ideally, they should be kept on top of a pebble fill tray of water to provide added humidity. Ideally, they should be watered with room temperature, but you should never pour the water directly over the crown of the plant, as this can cause the corm to rot. Keep them out of drafts!. Your Cyclamen will continue to bloom from December up until April if it is kept cool and happy. As the flower stalks and leaves die off they should be removed by giving them a sharp tug. New foliage and flowers will soon replace the old. The corm of the Cyclamen plant will naturally go into dormancy sometime after April. At that time, gradually reduce the water and keep the plant in a cool, darker place. Allow the corm to slowly dry out. Replant it in a shaded area of the garden in the spring. In the garden, Cyclamen should be planted with half of the corm just below the soil surface. In late July or August, when the tiny new leaves begin to develop, transplant it into a pot using a rich sandy potting soil but leave it outdoors. Keep the bed on which the pot stands moist. In early fall the potted corm can be again moved into the house, where it should be kept in a window where it will receive a few hours of morning sun each day. Potted Cyclamen should be fed monthly with a diluted have strength liquid house plant fertilizer. Cyclamen can be grown from seed, but it takes up to eighteen months before you will see your first flowers. You may be better off to purchase your plant from a nursery if you tend to be an impatient gardener. 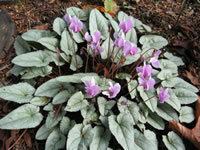 Hardy Cyclamen should be planted in a semi shady area of the garden in August or September. with a generous amount of leaf mold added. 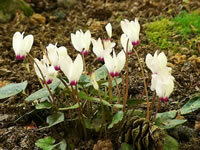 Different varieties of hardy Cyclamen may root from either the bottom or top of the corm. Be certain to plant the appropriate side up!